FSAstore.com is a one-stop-destination for Flexible Spending Accounts, where visitors can buy FSA eligible products, search for services, and learn more about their FSA. Their marketing team, led by CMO Ujjwal Dhoot, uses A/B testing and optimization to increase purchases across the website. The team meets monthly to strategize around new test ideas and then on a weekly basis to track current tests. During these meetings, Ujjwal’s team prioritizes which tests to take on based on impact and time involved to get each one up and running. They focus on areas of the conversion funnel where they know testing will have the greatest impact: the homepage, category pages, product pages, cart pages, and checkout pages. From there, they build a list of elements to test on each page (or across multiple pages) and prioritize based on believed impact. They also use Google Analytics to track user behaviors and patterns, and integrate that information directly into Optimizely to inform hypotheses. FSAstore.com’s primary conversion goal is to consistently increase revenue per visitor (RPV). One particular challenge in reaching this goal is a high level of drop-off in the website’s customer purchase funnel. Ujjwal and his team believed that site visitors were getting distracted by too many options in the purchase funnel, especially on the site’s category pages. 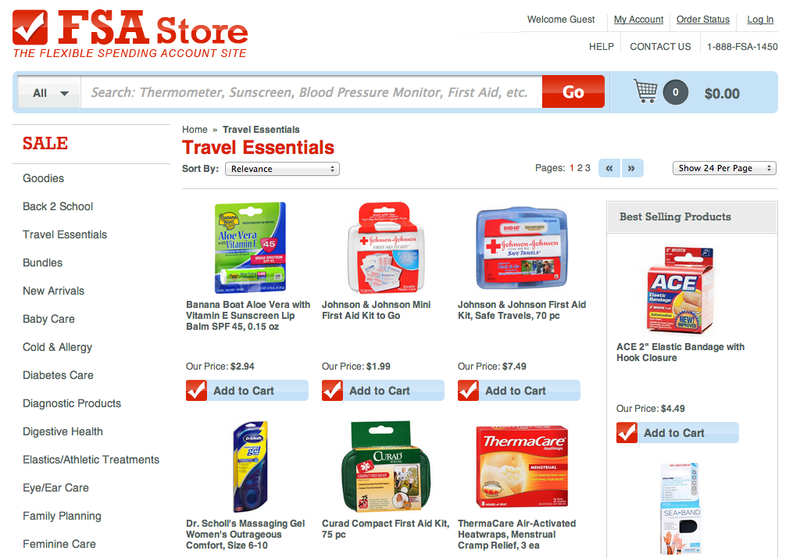 The original version of FSAstore.com’s category pages included a header with many different elements: a search bar, log-in options, contact information, and sub-categories featuring information on offers and benefits. The original FSAstore navication experience on a category page. Ujjwal hypothesized that removing the sub-categories would help site visitors focus on the products featured on each category page, driving more through to make a purchase. Using Optimizely’s drag-and-drop editor, he built a variation of the category pages that removed the sub-categories from the header. The variation experience removed the top-level navigation from category pages. He set 50/50 traffic to each variation and watched as the results came in. The improvement was unmistakable. Removing the sub-categories from FSAstore.com’s category pages increased revenue per visitor by 53.8%. Ujjwal and his team used Optimizely to quickly deploy the winning variation to 100% of site visitors, without having to wait for their design and development teams to build the changes into the site. In building their testing culture, Ujjwal has found one thing to be particularly helpful: strong internal communication. Sharing wins, losses, and learnings from testing on a regular basis has helped the team validate their optimization strategy. They encourage others across the organization to share ideas and trends they’re noticing in customer interactions. It’s a proactive way to spot trends and test them to measure impact. Now, FSAstore.com’s culture is focused on optimizing each customer touch point, whether it’s outbound phone calls, postcards and emails to customers, copy and landing pages for PPC campaigns, or their website. Like Ujjwal and his team, successful testing organizations put a high focus on information sharing, communicating goals, strategy, and outcomes to their colleagues on a regular basis. This helps validate optimization spend, secure buy-in from stakeholders, and engrain experimentation and data into company culture. When it comes to optimization, the possibilities of what to test are endless. Buy taking stock of key challenges in the purchase funnel and assessing which changes will drive the most impact, Ujjwal and his team were able to prioritize in a smart way and garner some critical wins for their business. They also take into account how long it will take to build and run each experiment, ensuring they’re spending time and resources on optimization initiatives that will move the needle. We really take the concept of optimizing the campaign through every single channel we have. We want to make sure our customers are getting the best experience possible, and that we are also maximizing the marketing dollars spent to acquire them.